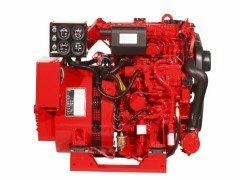 Designed by Westerbeke, the Company that pioneered the truly “quiet breed” of generators, the 3-cylinder, 4-cycle 10.0 BTDA is powerfully quiet. Running at 1800 RPM with a tuned air intake silencer and four point vibration mounts, the 10.0 BTDA runs smooth and quiet. This generator also has one of the smallest envelopes available in its class. The 10.0 BTDA is engineered to operate in a hostile marine environment. It is designed and built using experience gained in supplying generators to the United States Navy and Coast Guard. Powerful but lightweight, it is economical to operate and designed to run at a slow 1800 RPM for longer life. To minimize engine maintenance, the 10.0 BTDA is fresh water cooled and equipped with a simple control system rather than complex, troublesome, electronic components. . Easy access to all servicing points and individually removable top and side panels of the optional sound enclosure allow easy installation and maintenance. The 10.0 BTDA is backed by Westerbeke’s 5-year limited warranty. The presence of Westerbeke in over 65 countries around the world provides customers with easy access to parts, service and technical support worldwide. Established in 1937, Westerbeke is committed to providing its customers with quality products and unequaled after sales support.